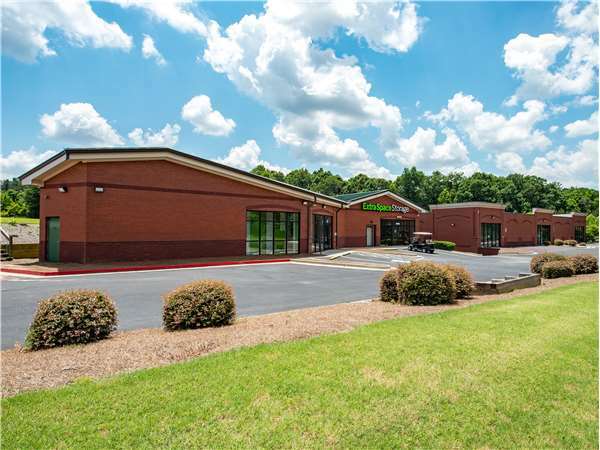 Located on Gravel Springs Rd just off Braselton Hwy, Extra Space Storage serves residents of Buford, Dacula, Auburn, Whitlock Farms, and Woodhaven Downs! Locals will recognize our facility near Walgreens and Mountain Crossing shopping center. With a wide selection of storage units, climate-controlled storage, drive-up access, and exceptional security, Extra Space Storage on Gravel Springs Rd is the storage partner you can trust in Buford! Store items large and small with ease at our Buford storage facility! We have units as small as 5x5 and as large as 20x20 with features like indoor access, first-floor access, and drive-up access. To ensure the safety of our customers and their belongings, our Gravel Springs Rd storage facility has an on-site resident manager, electronic gate access, and 24-hour video surveillance. A climate-controlled unit is highly recommended if you plan to store temperature-sensitive items. With this feature, your unit stays between 55 and 80° at all times, protecting your items from extreme heat and humidity. Units with climate control are available in sizes 5x5 to 20x20. With a drive-up access storage unit, you can easily unload and load heavy items right from your vehicle. This amenity provides the ultimate self storage convenience! Drive-up units come in sizes 5x10 to 10x40. When you choose Extra Space Storage, you can expect nothing but the best! We maintain a clean, secure facility at all times to ensure our customers get reliable storage, and our friendly, professional team is dedicated to delivering excellent service. Contact us today to reserve a storage unit in Buford! The best storage facility in the area...convenient locations and easy access. Good, fair pricing and helpful staff! Personnel knowlegeable and made it easy to solve our issues and needs. The unit is very clean and its accessible to you 24 hours day. If you have any problems, the agent at the front desk is always willing to help you. Very friendly staff. Clean and convenient location. Extra Storage was conveniently located, well priced, and their customer service was excellent. Manager Tina took the time to understand my needs and helped me find the best space available for the price point I needed. Thanks Tina! This is a very clean and well kept facility. I have been very pleased with the conveniences that are provided and extra storage has made our move easier. The staff are helpful and very friendly! Great location and reasonable price. Manger of the facility on Gravel Spring location, Micheal is an excellent guy and a pleasure dealing with him. It is clean, well secured and two easy access to the units. Clean, well maintained and constructed storage facility. Employees are awesome. Very helpful and friendly. I feel like my items are safe and secure!! Two thumbs up. The staff is wonderful and I really enjoyed working with Mike. He was very professional and helpful. I would strongly recommend this facility. It is very clean! The people were great, especially Mike. They all went out of their way to help me. I always felt safe and secure at the facility even at night. It's very clean, well maintained and the price is good. I recommended the facility to a friend. Reservation was great, she gave me Discount and first month free, at store Mike and Tasha were extraordinary, very helpful, courteous, professional and friendly. Cute Tasha was very sweet. I've checked with 4 other storage unit locations in the area and this one was the friendliest, most welcoming, most knowledgeable, most willing to help and they thanked me several times for my business. AND.....the place is very clean!!!! I'm moving to Georgia, and I got my first taste of Georgia hospitality. Drive southeast on Gravel Springs Rd/GA-324. Pass I-85 and continue straight. Our facility will be on the right before Kroger. Drive northwest on Auburn Rd/GA-324. Pass Walgreens and continue straight onto Gravel Springs Rd. Make a u-turn at Matlin Way. Our facility will be on the right. Drive southwest on Hog Mountain Rd. Turn left onto Hog Mountain Church Rd NE. Turn right onto Auburn Rd/GA-324 W. Pass Walgreens and continue straight onto Gravel Springs Rd. Make a u-turn at Matlin Way. Our facility will be on the right. Drive northeast on Sunny Hill Rd. Pass Mountain View High School and continue onto Morgan Rd. Turn right onto Gravel Springs Rd/GA-324 E. Our facility will be on the right.